Updated the Plugin and added some new Tab types and Better handling of webpages. The Sonicwall 'Should' work now. Ah yes, thanks Ben, maybe I can revise that later then. Update sounds good, I'll let you know on the SW side of things when installed, just one idiot question, to update I just re-run the updated installer I presume, all settings retained? Just one final thought Greg, I had to effectively move the contents of one group to another to keep them in Alphabetical order, which if you have a lot can be a bit of a pain, maybe a Sort Order for Groups like the tabs would be a good idea? Just a thought I wanted to throw out there, certainly not a requirement, once again, thanks Greg. I like the new additions. Mutlicolumn EDF and the ablility to select...very nice . :mrgreen: Great job on continuously improving. Time to rethink additional options and tabs. Thank you. I like the sort order. Good Idea. Yes to update Just run it and click update. All setting are retained. Not sure if you are aware Greg but there is a Character limit in the tab contents field preventing you from having too many search terms in the results, this is why I have Stage 1+2 and Stage 3+4 above because I simply cannot fit all 4 stages on one tab, if I am brutally honest I don't know if I want it all on one tab, the scroll bar I might be forced with might just ruin it, as it is though I'll never know. *Sorry for keeping you busy Greg, feel free to tell me where to go. On another note, could someone please give me an example of a Global Replacement as used in this Plugin as I think I am missing the point of it. A global replacement would be like a property\global used in a script. It would be a main value. Like maybe if you are making urls to your managemnt system this might be the username and password. Now you could put this in the URL part of the custom tab, but when you export it the other person would need to edit the tab instead of just changing a value on the main screen. Thanks Greg that makes sense. Just had a look through the update, the Webpage change is great as with the button to open in a default browser, strangely that works on Sonicwalls but any created button directed at %routeraddress% which happens to be a Sonicwall still fails. Anyhow with this change my button is redundant so that bug which I have only seen effect SW's is not an issue, this also allows you to keep the same page you have navigated to which mine didn't so it's far better. Hi Greg, the multiple Columns work superbly thank you, the split Webpage \ EDF field however has some issues, firstly as you'll see in the screenshot below it doesn't seem to pass a variable through for the webpage but instead searches for the variable name, I know the variable is good as I copied it from a working tab. The second thing is just feedback, if you look at the screenie below the EDF's take up quite a lot of space though only two are present, I can resize but it doesn't remember, if it auto-sized that would be amazing, if not the ability to configure it per tab maybe? Either way though, great work. Ok here is some pics of my deployment tabs making use of the new 2 Column feature! I have my own, created it before I saw Michael's, I have spoken to him about his one briefly and have looked through the screenshots but don't know enough about it to tell you differences. But mine is a triple tiered permissions based deployment system built originally for Ninite but as you can see from the shots also handles other apps (MSI \ Other Tab). *It requires just 4 EDF's for each app (1 Settings EDF at Client, Location and Computer and 1 Results EDF on Computers). *Scripts are built in a way to allow anyone half competent to add their own apps (ninite or not), so long as you have working install \ uninstall strings you app can be included. *Allows installation \ uninstallation \ update of any app for a client site, location or just computer. *Apply too Servers \ Workstations or everything at both Client and Location level. *Makes use of Ninite's Update All switch whilst still allowing specific versions (speeds up, updates significantly). *Makes full use of Labtech Cache for all apps including Ninite. *Full Error reporting and installation \ uninstallation recording to EDF fields (Ninite Updates are NOT logged). *Options Include: "Install, Uninstall, Install Specific Version, Ignore, Ban" or simply "Update IF Installed!" Some apps have specific options but the vast majority are standardized. *The ability to set your own company defaults! Generally speaking P+S is run and it does the rest, however Software is handy, as if you know something failed, say Firefox didn't update as the user didn't close it as promised, running Update Software will skip the permissions part speeding up the process when re-run. Then the Software script converts these back to a Ninite style list, checks the actually installation status of said app then creates it's own sub list, this goes through until the list has just the items let which are listed to Install but NOT already installed, and visa versa. The beauty is the list is always the effective permissions so you can always see what should apply if something is going a little wrong (which I am glad to say it doesn't). There are a few more nice touches too (even if I say so myself) . Firstly as the Software script TEST's the LT Cache's current availability before executing to prevent hangs this can introduce a small extra delay in some case, generally speaking nobody case, but you can all the same enter Y in an override variable to force it to run Locally. Secondly and I think this is used even less (much to my annoyance), but the script has the option for a selective list, say you don't want to wait for it to process every app you have configured when running Update P\S\P+S you can enter just the desired apps in separated by coma's when executing the scripts to have it check \ install just those apps. *But before you ask, it's not available right now, I have some Branding to remove mostly and a little tidying up to do before I would be happy to release it in any sense of the word. Ho, you've certainly put a lot of effort into your LabTech deployment, and it shows! There's some great work and ideas here, and you should be congratulated for your efforts and willingness to share it with us. That being said, i'd also like to share what I have acomplished with the CustomTabs plugin. Much like yourself, i've utilized the plugin to present easier management of Ninite which is all setup and configured using the free scrips available from the Ninite website. At the customer level is where we enable/disable Ninite management for a customer. Enable/Disable Ninite management for this customer. 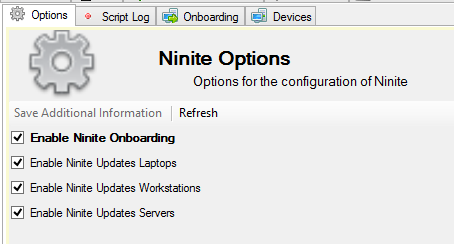 This tab shows a list of all devices at the selected client that is configured to receive Ninite updates. 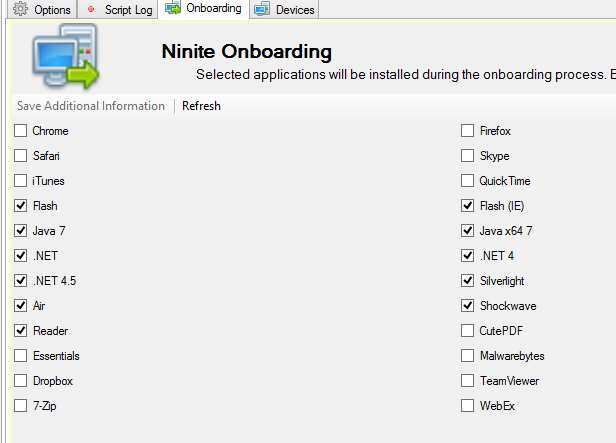 At the location level, we can specify more granular options for Ninite, such as which device classes to update/ignore, which applications to install during the onboarding process etc. Enable onboarding for the currently selected location, and specify which device classes to receive updates. Select which applications will be installed during the onboarding process. Displays which devices are at this location are currently receiving updates via Ninite. At the device level, we can specify overrides and exclusions for a specific device. For example, we have some devices out there in user land that must run a specific old version of Java, so we set the exclusion for Ninite to update Java here. Displays whether the onboarding process is complete, and allows us to disable Ninite updates entirely for the selected device. 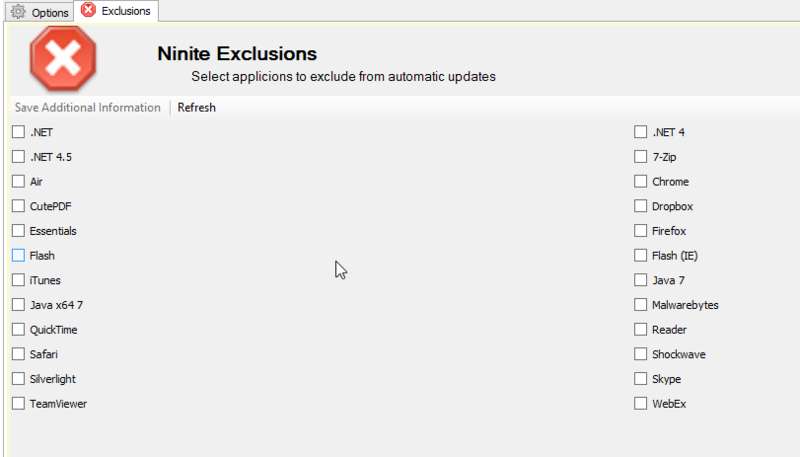 Specify any applications to exclude from automatic updates via Ninite. How did you attach so many photos to your post, it would let me add past 3? I just uploaded them to imgur and linked the URLs. Ah yes that will do it, didn't check your URL's but I know there was a post from Greg which exceeded it whilst the pics were still in the forum, guess that's just a user setting. Fine external it is then. On a Multiple column EDF tab, is there any way to sort the EDFs besides trying to decipher the string in the EDF List? If you wanted to change that though use the SORT ORDER for the EDFs as well and you can get whatever you need. Hoe, it would be cool to see some more on your Custom Tabs. I'd sit here and screenshot the lot if I had a 105 hour day! This tab should be "http://www.123reg.co.uk" but it sticks on whatever the previous tab was on, in this case it was URL3 which by default is this pagecannotbedisplayed.com (in this case without www but thats my error, ignore). Additionally the LT Windows will just show an hour glass until you change tabs. This only occurs then using the Split Webpage View. On the Split tab, Make sure you enter a Number for Height and save it. Do not let it be blank or a NON number. This could be the problem.